Sometimes, there are downsides to being a Vegetarian, one of these being that you typically have to be quite careful about the kinds of sweets that you buy as a family. Hidden animal products are rife in sweets, and unless you know what you're looking for, it can be hard to differentiate between those which are vegetarian, and those which are not. A seemingly innocuous packet of sweets can appear to be vegetarian, when in reality, there are all kinds of ground animal bones and beetle colourings contained inside. In the wake of the recent horse-meat scandal, even meat-eaters should be conscious of what is really going into the sweets they eat. Recently, I found out about Better Bunny - a new vegetarian sweet made without animal gelatin, and aimed at encouraging customers to go veggie. 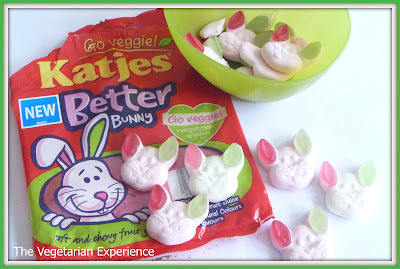 Launched by Katjes, one of the largest manufacturers of fruit gum & liquorice products in western Europe, these soft, chewy foam rabbits are a real treat for the taste buds, and are great for veggies, and non-veggies alike. Better Bunny sweets are made from real fruit juice, contain only natural colours and flavours, and are also 99% fat free, so you can feel guilt-free (mainly) about eating them! They are also a great choice for Vegetarian kids. Vegetarian kids can eat them, without feeling that they are missing out on the likes of haribo and other jelly sweets, so also great for when they have friends over. My kids loved them when they tried them, as the sweets taste so delicious. Better Bunny sweets are on sale at Tesco's for £1.00 per 170g packet - great value for truly vegetarian sweets! You can find out more about Better Bunny on their facebook page, or the Katjes website, Better Bunny are hosting sampling in the east of England, so check out the schedule on their facebook page for your nearest tasting. I would definitely recommend these tasty Vegetarian treats to all fellow veggies! Disclosure: I received a review sample, and payment for this article.